At 630 feet tall, the Gateway Arch is the largest national monument in America. Finland-born architect Eero Saarinen won a nationwide competition to design the monument with his stainless-steel arch design. The arch was designed to sway in the wind and can move up to an inch over the course of an hour when the wind speed measures 20 miles per hour. Most people reach the top of the arch via tram, but those who take the stairs will have 1,076 steps between them and the top. The 16 windows at the top of the arch offer amazing views of the St. Louis skyline and the Mississippi River. Located underneath the arch, the Museum of Westward Expansion details the journey of the explorers Lewis and Clark. The St. Louis Arch, properly called the Gateway Arch, stands in the middle of the country today, but at one time St. Louis was the beginning of the frontier. If it weren’t for Thomas Jefferson’s brilliant Louisiana Purchase, America may not have been the county it is today. He sent explorers Lewis and Clark to explorer this vast territory, and their journey began in St. Louis. The views from the top of the St. Louis arch are simply stunning. A tram ride brings visitors to the top of the arch, where they can see up to 30 miles on a clear day. The tallest point in St. Louis offers great views of the city skyline across the river to Illinois. After the trip to the top and back to the ground, visitors can watch movies, visit the Museum of Westward expansion, and even take a riverboat ride to check out the national monument from the Mississippi River flowing close by. The arch is the centerpiece of the Jefferson National Expansion Memorial, which also includes the city’s old courthouse and the Museum of Westward Expansion. Construction on the arch began in 1963 and it was finished two years later on October 28, 1965. It took less than $15 million to bring the arch into existence. The monument to the Western pioneers was built to withstand inclement weather, so the foundations go 60 feet below ground. When high winds come, the arch can sway nearly two feet. Long before Saarinen designed the Arch, St. Louis was famous for its brewing heritage. 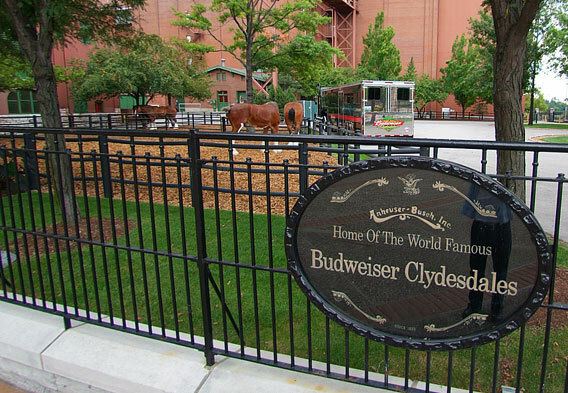 Even today, tours of the Anheuser-Busch Brewery are popular additions to St. Louis itineraries. The tour reveals both the history of the company and its modern brewing methods as it visits the packaging plant, historic brew house, and the cellar. The tour also includes a visit to the stables where the Budweiser Clydesdales live, the gift shop, and the Hospitality Center. Those who want to see more of the Budweiser Clydesdales should add a visit to Grant’s Farm. The former country estate of the Busch family once a homestead of President Ulysses S. Grant is today a 281-acre wildlife preserve. 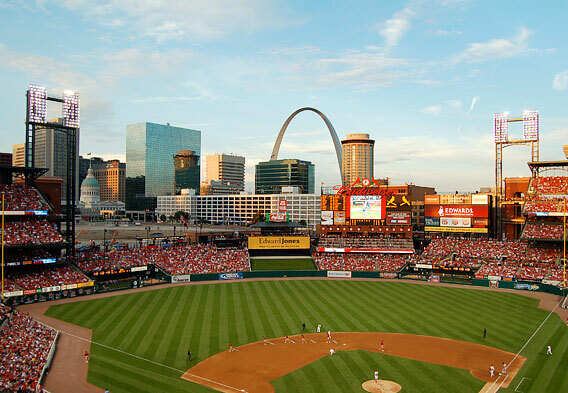 Also named for the first family of St. Louis brewing, Busch Stadium is a sports fan’s dream. The fan-friendly major league baseball park is the home of the St. Louis Cardinals, one of the winningest teams in the National League. When the Cardinals are on the road, or it’s the off-season, the 46,000-seat stadium is open to tours. 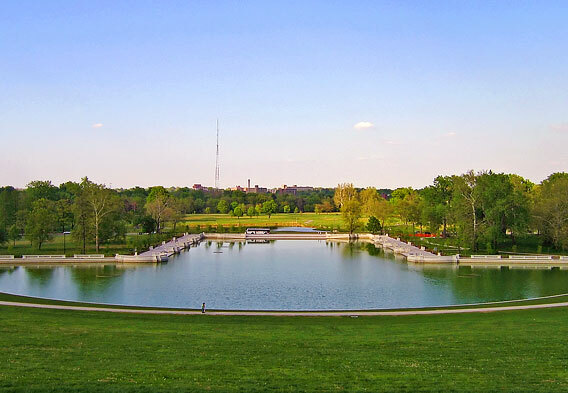 Another St. Louis landmark, Forest Park also celebrates the push westward. Open in 1876 for the Louisiana Purchase Exposition, the park quickly drew into one of the most visited places in St. Louis. In 1904, the World’s Fair brought more than 20 million people to the park! Many landmarks remain from the World’s Fair era, and several of the most popular attractions are located within the park, including the St. Louis Zoo, Missouri History Museum, and the St. Louis Art Museum.